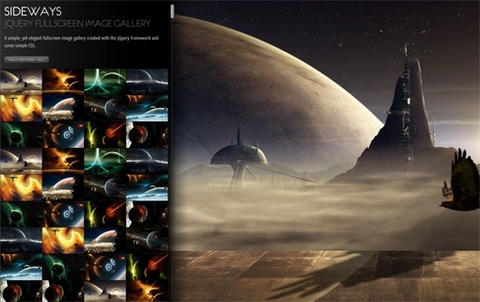 Sideways is a simple, yet elegant fullscreen image gallery created with the jQuery framework and some simple CSS. It utilizes the jQuery UI (jQuery User Interface), jQuery Easing by George McGinley Smith and Brandon Aaron jquery mousewheel plugin. You can use Sideways on both personal and commercial projects you choose, develop it further or just make it better.